As discussed in WAGER 7(43), research suggests that the ventromedial prefrontal cortex (VmPFC) area of the brain might be involved in decision-making mechanisms that affect gambling behavior. Using a gambling task designed by Bechara et al. (1994), several studies have shown that subjects with impaired VmPFC function due to brain lesions demonstrate impaired judgment in gambling situations (Bechara et al., 1994; Bechara, Damasio, Tranel, & Anderson, 1998). Research has shown that drug abusers can exhibit similar deficiencies (Bolla et al., 2003). Using the Bechara gambling task, Bartzokis et al. (2000) compared abstinent cocaine dependent (CD) subjects with non-abstinent CD subjects to examine whether decision-making functionality returns upon drug discontinuance. This week’s WAGER presents their results. Bartzokis et al. (2000) recruited six newly-abstinent (i.e., at least four days, no more than 30 days) CD males and six non-abstinent CD males to take part in their pilot study. Subjects ranged in age from 33 to 55 and were CD for at least one year. With the exception of nicotine and alcohol, the authors excluded individuals who indicated comorbid substance use. They also excluded individuals with psychiatric disorders other than CD. The study recruited all subjects from an outpatient drug treatment program at a metropolitan VA hospital. To test VmPFC function, the authors asked all subjects to complete a computerized version of the Bechara gambling task (1994), which requires subjects to maximize gambling profits through their choice of low-or high-risk gambling scenarios (see WAGER 7(43) for a detailed description). To do well on the gambling task, subjects must have normal VmPFC brain function. Scores on the gambling task range from -60 to 60, with a higher score indicating a preference for low-risk choices and healthy VmPFC function. All subjects also completed two control tasks, the Wisconsin Card Sorting Test (WCST) and the California Verbal Learning Test (CVLT). 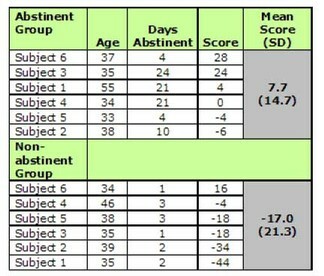 Table 1 presents the gambling task score for each of the subjects. Non-abstainers performed poorly on the gambling task compared to abstainers (t = 2.33, p = .04), with five of six non-abstinent CD subjects generating negative scores (mean score = -17.0, SD 21.3). This might suggest an affinity for high-risk behaviors and VmPFC deficiency among current cocaine users. Abstinent subjects generated higher and predominantly positive scores (mean score = 7.7, SD = 14.7), suggesting normal VmPFC function. There was no statistically significant difference in performance on the control tasks between the abstinent and non-abstinent groups, localizing cognitive deficiency between the two groups to the VmPFC. There are several limitations to this study. First, this article reflects the results of a pilot study; consequently, the sample is small (n=12) and homogeneous (middle-aged males only), and might not be truly representative of the cocaine dependent population. In addition, the study did not assess abstainers before they gave up cocaine; thus, it is unknown whether abstainers experienced a change in VmPFC function, or simply functioned differently from non-abstainers from the start. The authors also did not exclude subjects with alcohol problems: since alcohol dependence can also impair brain function, this could have affected gambling behavior. Finally, it is uncertain how the researchers determined the cutoff between “non-abstinent” and “abstinent.” The authors provided no justification for defining “abstinence” as more than three days without cocaine. We analyzed the results using adjacent cut-points of more than four and more than two days without cocaine, and the group means on the gambling task were not statistically significant for either alternate definition. A more scientific basis for grouping subjects would preclude an interpretation that the study used an opportunistic cutoff point to define groups. While these results reflect the performance of only a small pilot sample, this study demonstrates the need for further study into the specific areas of the brain affected by addictive behaviors. For example, identification of a non-gambling task mediated by the VmPFC could further test brain function in PGs and provide a comparison against findings generated by Bechara’s gambling task. In addition, Bartzokis et al’s results suggest that rather than evolving independently, addictions might have common neurobiological roots, providing support for an addiction “syndrome.” Further study targeting areas of the brain known to be associated with specific addictions could yield psychological and pharmacological alternatives capable of simultaneously treating multiple comorbid addictive behaviors. Such treatments would not only aid patients during recovery, but would also help those with multiple addictions maintain long-term abstinence. Comments on this article can be addressed to Tony Donato at wager@hms.harvard.edu. Bartzokis, G., Lu, P. H., Beckson, M., Rapoport, R., Grant, S., Wiseman, E. J., & London, E. D. (2000). Abstinence from cocaine reduces high-risk responses on a gambling task. Neuropsychopharmacology, 22(1). Bechara, A., Damasio, H., Tranel, D., & Anderson, S.W. (1998). Dissociation of working memory from decision making within the human prefrontal cortex. Journal of Neuroscience, 18(1), 428-437. Bolla, K. I., Eldreth, D. A., London, E. D., Kiehl, K. A., Mouratidis, M., Contoreggi, C., Matochik, J. A., Kurian, V., Cadet, J. L., Kimes, A. S., Funderburk, F. R., & Ernst, M. (2003). Orbitofrontal cortex dysfunction in abstinent cocaine abusers performing a decision-making task. NeuroImage, 19, 1085-1094.